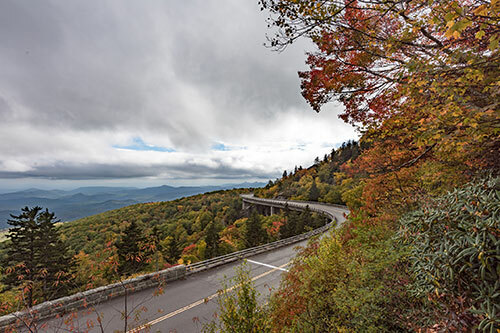 Begin your North Carolina road trip in Black Mountain and head east out of town on the gorgeous Blue Ridge Parkway, the scenic highway that crests the southern Appalachian Mountains. 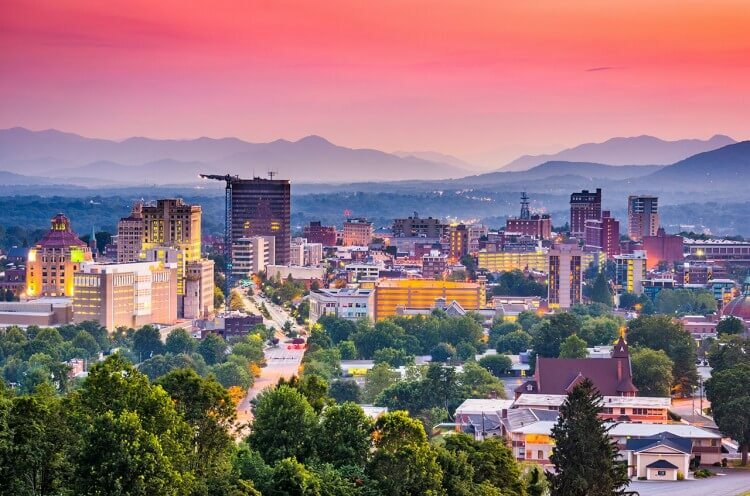 You'll get a true feel for the beauty of Asheville and its surroundings this way. On your way back, visit the Folk Art Center (also on Blue Ridge Parkway) for traditional and contemporary Southern Appalachian arts and crafts. Asheville's Grove Park Inn Resort & Spa is heaven for fans of the Arts and Crafts era, while the 250-room Biltmore Estate, with its fine art, 65 fireplaces, winery, and lush gardens is a good way to conclude this Asheville, North Carolina road trip. Golfers intimidated by long par-five holes should beware of the par-six at Black Mountain Golf Club, where one of the world's longest fairways stretches 747 yards. The town of Black Mountain is Asheville in miniature, with arts and crafts studios, eateries, close to 50 antique stores, and music halls where you can hear bluegrass, jazz, acoustic folk, and classical music—all in a town just 10 blocks long. For a sophisticated take on southern fare, head for the Red Rocker Inn, a highly rated bed-and-breakfast at Black Mountain. Dinners, accompanied by hot buttermilk biscuits and homemade apple butter, feature slow-roasted pot roast, fresh local mountain trout, and roasted lime ginger chicken. With a mission to preserve and interpret the folk arts of the southern Appalachians, this center has exhibition galleries with changing displays, a library, a bookstore, and the Allanstand Craft Shop. After a visit here, you'll better understand the artisans who create, sew, throw, weave, and whittle crafts unique to the Blue Ridge region. A BRP information desk will acquaint you with the other area attractions, and a nearby trail will entice you to stretch your legs a bit more. E.W. Grove made his fortune in patent medicines, but his lasting legacy is this elegant inn. Opened in 1913, the 513-room lodge seems perfectly suited to Asheville, framed by a forested backdrop and fronted by an expansive lawn. Inside you'll find exquisite and original Arts & Crafts décor, including 700 custom-made pieces of furniture and 600 hand-hammered copper light fixtures. If you're an F. Scott Fitzgerald fan, request Room 441, which is where he stayed and worked. Guest rooms throughout have solid-oak Stickley and Roycroft furnishings and cottage-style windows that open to mountain, golf course, or courtyard views. The Main Inn has the most traditional atmosphere, while the Vanderbilt and Sammons wings are more modern. The spa here is critically acclaimed. The spectacular golf course was designed by Donald Ross in 1926. Another of America's literary giants, Thomas Wolfe, was born and raised in Asheville. He spent his boyhood years at his mother's boarding house, Old Kentucky Home, which he immortalized in his autobiographical novel, Look Homeward, Angel. A visitor center displays personal effects from the Wolfe family home and the writer's New York City apartment. An audio-visual program on Wolfe's life and writing is shown hourly and guided tours of the boarding house are offered. Modeled after a 16th-century chateau in France's Loire Valley, George W. Vanderbilt's 250-room mansion was completed in 1895. America's largest privately owned home has more than 4 acres of floor space, 65 fireplaces, 43 bathrooms, 34 bedrooms, and 3 kitchens. You need a full day to explore the mansion, the gardens, and beyond—an estate tour is only party of the experience. You can also visit the winery for tastings or tours, or stop by the Antler Hill Village, once the center of life for Vanderbilt employees who raised crops, tended livestock, worked in the Biltmore Dairy, and cared for the mansion. Today, the village is alive with blacksmiths, woodworkers, and other artisans. The Smokehouse serves barbecue, sandwiches, and traditional southern dishes. Note that reserving tour tickets in advance can save you a few bucks. Reserve an entire day and night for exploring and camping at Kirklands Creek Campground, situated off Highway 74 and Route 19 near the Tucksaseegee River. Known as the best campground in the area, there is much to do and see during any time of the year. Conveniently positioned in the heart of the Great Smoky Mountains, the town of Bryson City offers incomparable views of its surrounding beauty. Spend the day exploring the area by hiking or biking along the Tsali Trail. The mountains itself are a fantastic sight, but you'll also take in breathtaking views of the waterfalls at Cades Cove. Go fishing on the river or horseback riding through the lush forest. And when it's time to turn in, you have the option of staying in your RV, pitching a tent, or renting one of the cozy cabins available onsite. Exhilarating outdoor adventures abound in this mountainous region. Whitewater rafting trips on numerous rivers are organized by Nantahala Outdoor Center. They also rent bikes and outfit hikers, as well as other adventures for outdoor fun.